When it comes to the sink in your kitchen, you would think that it would be relatively clean considering how many times per day you use it. However, merely letting the water run down the drain throughout the day does nothing to kill the germs and bacteria that grow in the drain causing it to smell less than fresh. If your sink has started to smell like a dumpster, you can learn how to clean a garbage disposal with these freshening tips. When cleaning the sink in your kitchen, you need to consider that the environment in the average in-sink garbage disposal is dark, cool, and moist, and sees a near constant flow of food waste that gets shredded and scattered about the unit. With these kinds of conditions, no wonder the garbage disposal smells from time to time. Cleaning a garbage disposal and eliminating odors is easy when you follow these tips. You can keep your garbage disposal in tip-top shape by making sure you never put any food scraps in the garbage disposal unit that won’t entirely dissolve or break up into tiny pieces. Fibrous food items like celery and banana peels, or items that clump badly, like rice or potato peels, won’t go through and should never be put in the disposer. You will have to unclog a garbage disposal with these items in it. Use mild, liquid dish soap and slather a generous amount onto a scrub brush or dish wand. Use the brush to scrub the visible part of your garbage disposal. Don’t forget to clean the joint where the rim of the disposal meets the sink basin, because small particles of food and debris can get trapped there. The joint area is also the perfect place for mold to grow. We highly recommend that when you are operating the garbage disposal, run the kitchen faucet to help get rid of all the food scraps that get trapped in the housing. If you have a smelly garbage disposal, you may need to give the housing unit a thorough soaking. Use the stopper to stop the sink drain and fill the sink basin halfway with water. Next, add a small amount of liquid dish soap or vinegar to the water. Then, unplug the drain and start up the disposer. Doing this will propel the soapy water through the housing unit and rinse off its nooks and crannies. Ice cubes can do more than cool down your drink during the summer; they can also be used in the sink disposal to clean it and eliminate odors. Start by turning the unit on and running cold water down the drain. Then empty two to four trays of ice cubes into the sink. Quickly feed the cubes into the sink garbage disposal. The ice cubes will freeze all the stuck food particles, causing them to break off the unit’s impeller blades and out of the holes of the flywheel. After the last cube is broken, let the water run for a full minute. When your garbage disposal emits a foul odor, you can neutralize the stench by grinding up citrus fruit like orange peels and lemon peels. Cut the fruit into wedges, turn on the disposer, and put the pieces of fruit down one at a time along with cold water. The citrus peels will work to clean the grind components of the disposal while the citrus scent will eliminate odors. It is essential that you only feed small chunks so the blades of the unit can deal with the tough peels. The fruit also acts as a fly repellent spray for garbage. If you have slimy residue in your garbage disposer, you can remove it with Kosher salt. Kosher salt is an effective abrasive cleaner that will dislodge the slimy residue that can cause your garbage disposal smell. Start by pouring a large cup of ice cubes into the disposer. Then switch the unit on and add half of the salt. The combination of salt and ice cubes will grind away what remains of the residue causing the odor. You don’t have to wait until your disposal starts to smell, with proper disposer care you can stop the smell before it even starts. Turn the garbage disposal on and run hot water through it for at least a minute. This action should be enough to push the waste through the drain pipes and through the rest of the house. Flushing water down the drain is the best way to eliminate odors from your garbage disposer. You should do this after every use. If you’ve tried the above cleaning tips and your garbage disposal still smells, you may need to try a tougher cleaning solution. For this method, you will use the powerful combination of baking soda and white vinegar. Start by lifting the flaps of the splatter guard and pour the baking soda into the unit. Continue to fill the entire drain until you aren’t able to add any more baking soda. Next, pour the vinegar down the drain. Vinegar is a natural deodorizer and will kill any bacteria that have made a home in your disposer. Allow the cleaning solution to sit for at least an hour. Turn the disposal on and run cold water down the drain for a minute. This garbage disposal cleaner method should be used sparingly because the acid in the vinegar can end up damaging the rubber elements inside your disposal. If the smell is still persistent, it may mean that improperly rinsed food waste has hardened in your pipes. If this is the case, you may need to deep clean your garbage disposal. To do this, you need to first start by running hot water through the pipes for about a minute. Then disconnect the pipe that leads from the garbage disposal underneath the sink. Next, attach a rubber test cap to the underside of the pipe that leads from the garbage disposal. Connecting a rubber test cap will allow you to soak the pipe with a cleaning solution and keep water from going through the pipe. Place a bucket underneath the rubber cap and pipe to catch any spills and runoff. Run warm water into the garbage disposal until the water reaches the top of the drain. Then add half a cup of powdered oxygen bleach to the drain. Leave it to sit for about an hour. Once the bleach has had time to soak, remove the cap and let the water drain into the bucket. Then reconnect your pipe. Often a more substantial item is causing a clog, which can trap smells. If you think that maybe a fork or spoon has fallen in and is catching food, you need to remove it. To remove a more significant item from your garbage disposal and unclog a kitchen sink, make sure to turn off the fuse that supplies power to the garbage disposal. Turning off the power to the disposal unit will eliminate any risk of the unit turning on when you are reaching inside. Next, use a flashlight to shine a light down into the disposer. Use needle-nose pliers to remove the item. Once you remove the thing, you can rinse your garbage disposal to see if you’ve solved the problem. 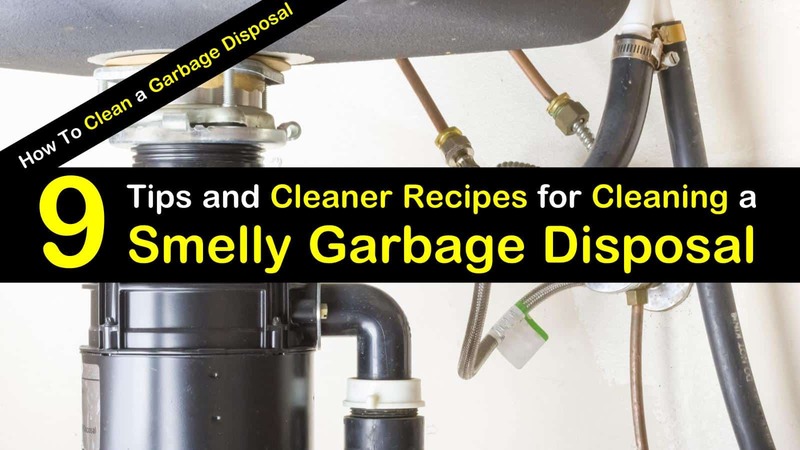 It is easy to eliminate smells in your garbage disposal, but preventing these smells in the first place is the best solution. Routine cleaning of your garbage disposal every week will help to keep your garbage disposal odor free and allow you to have a clean kitchen. Always remember to run water down the drain while you are using the garbage disposal to help keep it clean and germ-free. 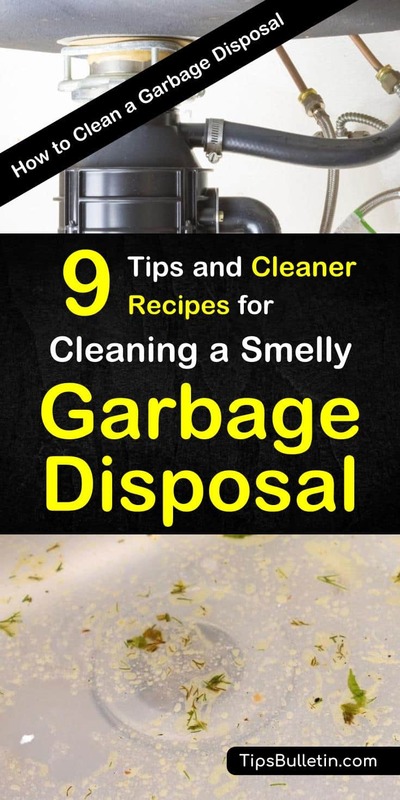 We hope you enjoyed learning how to clean a garbage disposal. If you found any of the information in this article useful, please feel free to share it with all your friends and family.